Whether you’re trying to keep an eye on your child’s babysitter while you’re off at work or you just want to know what is going on in your office while you’re not around, a spy camera can be a perfect opportunity to capture all of this and more on your own terms. However, when it comes to actually buying this type of surveillance device, there are certainly a host of different options for you to consider depending on what you’re trying to do and why you’re trying to do it. In order to better narrow down your options to help make sure your purchase is a sound one, there are a few key things you’ll want to keep in mind. Buying a spy camera is one of those situations where buyer reviews really come in handy—you just need to know how to read them properly. Regardless of what type of camera you’re trying to buy or where you’re buying it from, the product page is probably littered with reviews that are both positive and negative. You’ll want to read them all, but you’ll want to keep a few key things in mind. First, take all emotion out of the equation. If someone leaves a negative review, really try to get a sense of WHY their experience was so bad. If you find a wall of text that amounts to “I couldn’t figure out how to make this work” or “I didn’t use it properly and now I’m mad,” you can probably go ahead and discount it. Presumably, you’ll read the directions and take care of issues related to this type of user error on your end. But be particularly mindful of reviews (especially multiple reviews) that give you a sense that the product doesn’t work as advertised. It promises to work great in low light, but the footage is hard to see. It’s supposed to record audio, but the sound is always distorted. Things like that can give you a better idea of what you’ll really be buying. Likewise, you also need to understand that not all spy cameras are created equally. There are many different types for you to choose from depending on your needs, and those needs should always dictate your purchase more than almost any other factor. Don’t start with a spy camera and work your way toward what you want to accomplish. Start with that end goal and work your way back to find the camera that fits in the way you need. 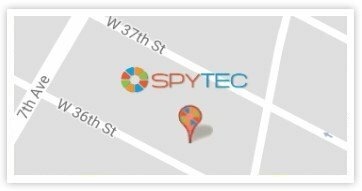 These days, spy cameras are available that are already concealed in just about every type of item you can think of: from clothes hooks to pens to sunglasses, smartphone cases, alarm clocks, desktop computer speakers and much, much more. If you’re trying to monitor a particular environment, choose a camera that reflects the type of object that is already likely to be in that space. This is the best way to avoid someone finding the location of the camera before you have what you need. Likewise, one of the most important factors to investigate has less to do with the camera itself and more to do with the warranty offered by the manufacturer and/or retailer. When you’re talking about something as sensitive as electronics, there is always the potential that issues may arise. This is especially true in something like a spy camera, where the item needs to be A) more powerful than a regular camera, and B) more discrete at the exact same time. Simply put, make sure that if something goes wrong (that isn’t the result of user error), you’re protected in some way and that you can get your money back. Always be wary of a retailer that offers absolutely no returns or warranties of any kind. Small, cheap parts can break with relative ease, and this is one situation you don’t want to find yourself in. At the very least, you’ll have the peace of mind that comes with knowing your hard-earned money went to the right place.